For this comparison test we put JP Australia’s CruisAir 11’6 x 30” and Allround Air 10’6 x 32” in a head to head. Both boards are constructed utilising the brand’s Superior Edition manufacturing techniques which ensures both JPs are light yet durable. The pair also came equipped with the means to take a sail ala windSUP mode which increases their versatility no end. With not a seam or stitch out of place both the 11’6 and 10’6 are premium SUPs with attention to detail given in all the right areas. Carry handles are padded and therefore comfy whilst being balanced. Deckpads are soft but grippy whilst upfront on both iSUPs you’ll find bungee lashing for when riders fancy heading off on a jaunt with daily essentials stowed aboard. Flip the boards over and you’ll locate a well-positioned D-ring if towing is required before heading back towards the tail to discover touring style US box fins – something we doff our caps to wholeheartedly. IF you’re planning on attaching a sail then there’s an additional fin box in the middle to help upwind performance and stop side slip downwind. All in both boards are easy on the eye and highly desirable. 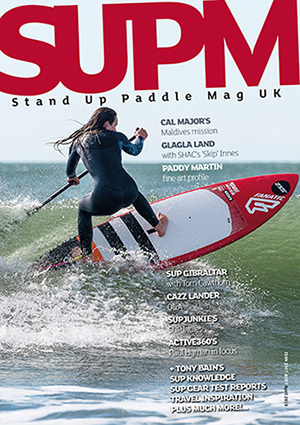 Helping us out for this particular test was Charlie Danby, who’s SUP skills can be described as ‘progressing’. Fitting the bigger boned category he commented just how stable the 10’6 is. At first he was sceptical but quickly came round to the board’s easy going performance and before long was sweeping away without a care. Rather than be a (now) old school round nose SUP the 10’6 AllroundAir benefits from an elongated front which aids tracking. The board knifes through the water and makes light work of distance, even with it being described as an all water board. Keeping up with the longer CruisAir 11’6 it can certainly hold its own when sojourning along coasts, up inlets or inspecting inland stretches of water. Feeling pretty planted there’s also an efficiency should wind and chop ramp up. 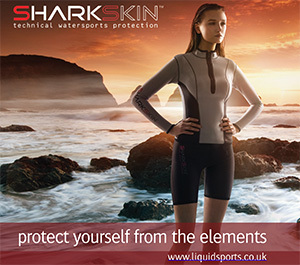 The included fin helps keep everything tracking straight and true with the overall experience being one of fun and ease. JP’s AllroundAir 10’6 is very much a hybrid shape with it being applicable to newbie paddlers as well a seasoned riders fancying a spot of discovery paddling. Slightly narrower (30”), yet longer than the AllroundAir, JP’s 11’6 is the same but different. There’s a lot of synergy between the two boards albeit with the longer iSUP offering a degree more glide and slightly improved tracking. This essentially translates to paddlers not having to put quite as many strokes in to cover the same ground (or water). Even though there’s a few inches less width stability issues are non-existent. Hopping between the two our helping hands tester Charlie got on fine with paddling a bit of distance. The real advantages of the 11’6 only became obvious when putting the hammer down and shoving it round a race course. During a light hearted, yet still competitive, event it was noticeable just how much vroom the 11’6 has. So much so that our experienced paddler made up four board lengths in one leg of the race (despite being disadvantaged during the start). Whether this is a thing for any prospective new owner is down to you to decide. Both JP Autsralia’s 10’6 AllroundAir and 11’6 CruisAir are examples of premium inflatables that are able to cope with multiple tasks. Being fun for newbies, yet applicable to touring and journeying, the only high end performance differences are when you drop the hammer aboard the 11’6. 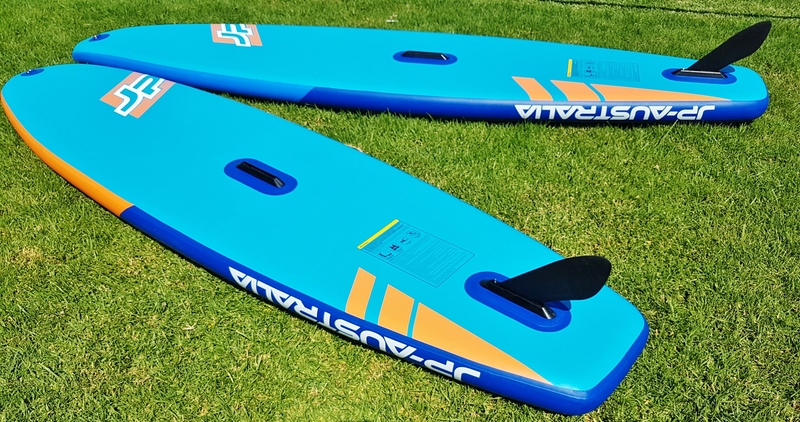 At this point you realise that the CruisAir slightly has the edge in terms of speed whereas the 10’6 pips the longer board when talking increased stability – particularly with bigger boned individuals in mind. Two refined inflatables that any sweeper would be happy to own. And don’t forget the windSUP option! 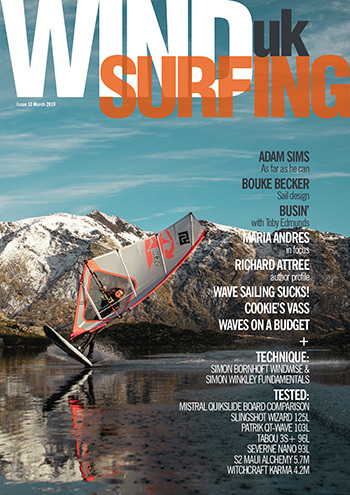 Thanks to Charlie Danby for helping with this review and also clubvass.com for supplying the demo gear.